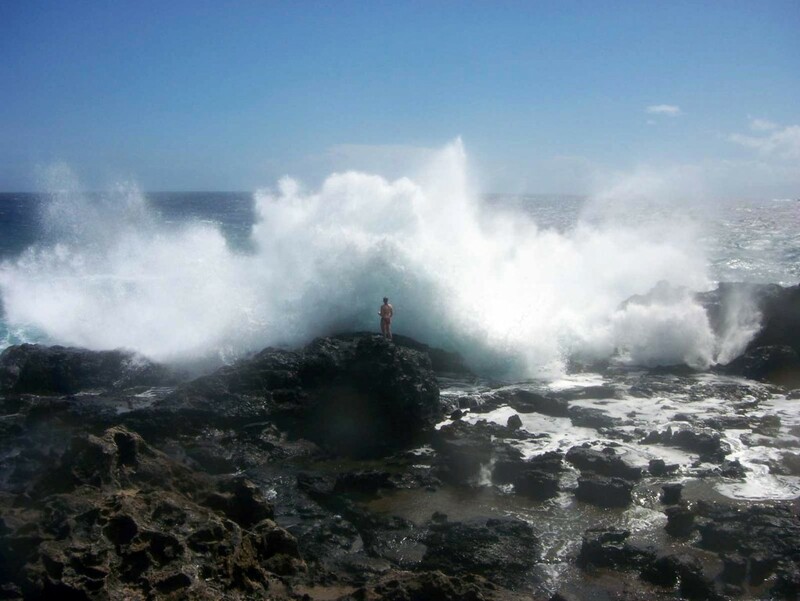 The Nakalele Blowhole on Maui’s northern shore is a favored spot by visitors and locals alike. Surging waves from the north produce massive swells, pummeling the a’a lava rock shoreline. Over time, this action has carved out a man-sized blowhole that regularly fires over 50 feet into the sky. Many visitors tempt fate by wandering near the blowhole to take a closer look. The sight and sound here is another awe inspiring Hawaiian reminder of just how small we are compared to the ocean. This picture captures a large spray catapulting directly up the ocean wall, the blowhole just in sight at the far left edge of the photo. Be warned: never get between a blowhole and the ocean, and never get close to this blowhole at all, death is a real possibility. The woman in this picture was luckily able to scamper back to higher ground unharmed.